K92 Mining (KNT.V) is poised for production at its Papua New Guinea (PNG) gold project and lists on the TSXV tomorrow under the symbol KNT. K92’s main asset is the Kainantu project in PNG, which has a large high-grade gold resource (1.84Moz @ 11.6 g/t AuEq. Inferred, and 240,000oz @ 13.3 g/t AuEq. Indicated, Nolidan, April 15th, 2016) and extensive infrastructure including underground mine development, a mill processing facility, a fully permitted tailings pond and paved roads to the site. The infrastructure means K92 can target to re-start mining in the near-term with minimal capital costs, and look to grow through cash-flow funded exploration on the roughly 405-sq-km property, considered prospective for additional discoveries. The Kainantu project was acquired from Barrick Gold (ABX.T), the world’s top gold miner, in 2015. 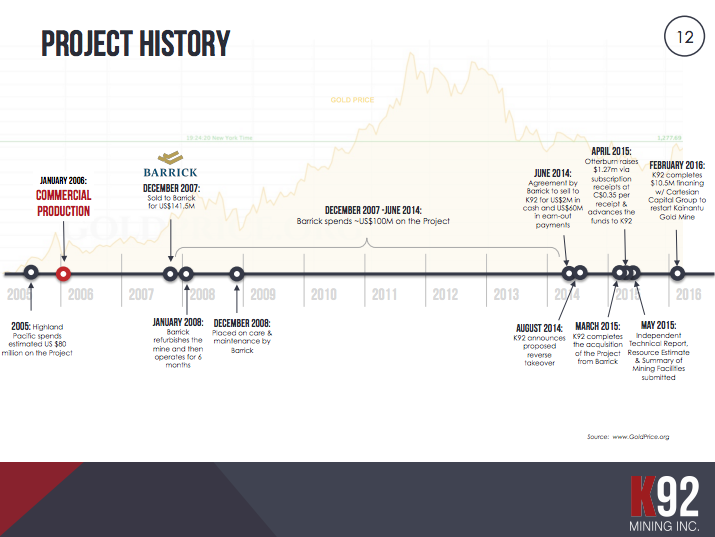 At the time, Barrick was undergoing a corporate rationalization and selling non-core assets. K92 paid Barrick an initial US$2 million to buy the mine and could make up to an additional US$60 million in future payments to Barrick if certain milestones are reached, such as producing more than 1 million ounces of gold over the next nine years. K92 picked up the project at a fraction of the cost of prior investment in it, reflecting the depressed state of mining when K92 negotiated the acquisition. Barrick paid US$141.5 million in cash for the asset in December 2007, then spent US$100 million upgrading infrastructure and on other expenses, and an additional $41.3 million on exploration and expansion efforts, including drilling 78,935 metres of core. That’s on top of the estimated US$80 million spent by the previous owner on development. Barrick operated the mine for six months in 2008 before shutting it down to focus on exploration at the property. K92 plans to re-start the mine using experienced contract miners, and is targeting near-term production. The roughly $47-million market cap company (fully diluted at $0.35 per share) had $10.7 million in working capital at March 31, 2016 and has arranged the full financing required for the re-start. A serious group of mining executives came together to form K92. The team is led by CEO Ian Stalker, a Scottish-born engineer and mine developer with nearly 40 years experience building and operating mines. The former AngloGold Ashanti managing director helped increase gold production there more than tenfold during the 1990s. He was CEO of Uramin when it sold to Areva for US$2.5 billion in 2007, and has worked on mining projects throughout Africa, Asia and Europe. Chairman Tookie Angus has been involved in several successful mining ventures including Ventana Gold and Nevsun Resources. President Bryan Slusarchuk, an ex-Canaccord broker, is helping the company raise money and tell its story. There’s a deep bench of operational talent in PNG, and advisors include Doug Kirwin, a mine finder previously with the Ivanhoe Group, and Alex Davidson, a former Barrick Executive Vice-President. K92 plans to start by mining the Irumafimpa deposit, which was previously in production. The nearby Kora deposit will then be explored targeting an expansion of mining operations, as will several untested targets on the broader property, Stalker told CEO.CA in a recent interview. “There’s a real chance of a very large mine popping out of this little company,” Stalker said. “And PNG is already the land of large mines,” he added. K92 is not without its challenges. Previous operators experienced dilution issues during mining, and had difficulty reconciling resource estimates with head grades. These issues are attributed to geological complexity and not enough understanding of grade distribution within the veins. Barrick also had some challenges with the local landowners on exploration access. There’s also the usual plethora of mining and exploration risks, not to mention financing during an epic mining downturn. But Stalker is optimistic K92’s asset quality will overcome its challenges and thinks the company is kicking into gear at the beginning of a gold recovery, and has the right ingredients to build a mid-tier gold miner in the coming years, including strong local support. There’s also the matter of $60 million in earn-out payments to Barrick, which would only trigger on the back of significant success by K92. Cartesian Capital, K92’s biggest investor, is due 18,000-20,000 ounces of gold during the first 36 months of operations, and retains a .25% NSR on the Kora deposit and 0.5% NSR on Irumafimpa. 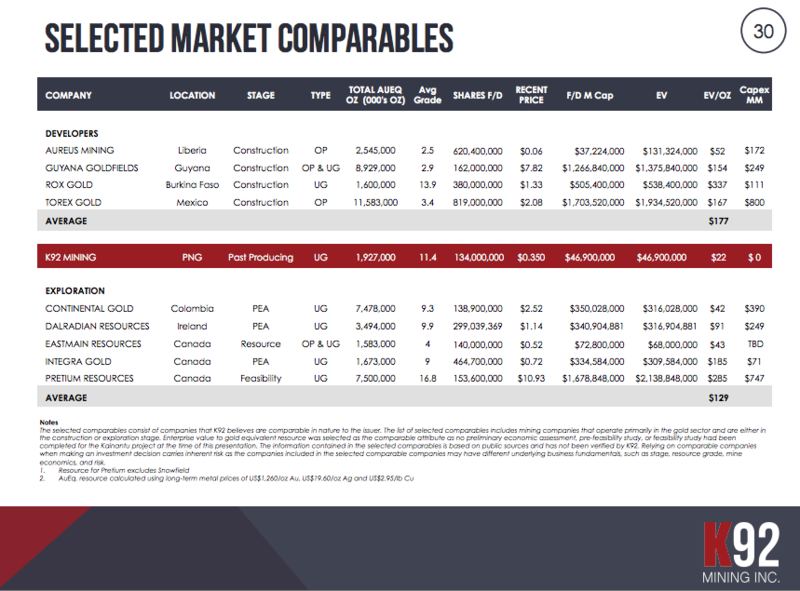 Still, the market value of K92 is a lot lower than other permitted, advanced-stage high-grade gold projects, which could make for interesting trading tomorrow. With serious management and the bulk of capex behind it, K92 Mining is well-positioned to build a strong new gold company. Watch our interview with K92 CEO Ian Stalker here and follow KNT on the TSXV. Investors interested in K92 should thoroughly do their own due diligence, including reading the company’s regulatory filings on SEDAR.com (formerly Otterburn Resources Corp $OBN). An April 15, 2016 Information Circular filed there has a lot of background information, and you should also consult a licensed investment advisor about the company and your personal financial situation prior to making any investing decisions. Nothing in this article is construed to be investment or professional advice of any kind. K92 Mining Inc. is aCEO.CA advertiser and author is long KNT.V at the time of writing. CAUTIONARY STATEMENT REGARDING FORWARD-LOOKING INFORMATION: This publication includes certain “forward-looking statements” under applicable Canadian securities legislation. Forward-looking statements are necessarily based upon a number of estimates and assumptions that, while considered reasonable, are subject to known and unknown risks, uncertainties, and other factors which may cause the actual results and future events to differ materially from those expressed or implied by such forward-looking statements. All statements that address future plans, activities, events or developments that K92 Mining Inc. believes, expects or anticipates will or may occur are forward-looking information. The material factors and assumptions include the ability of K92 Mining Inc. to meet the conditions for listing of the Exchange; repay and satisfy its obligations owed to CRH; restart of mining and processing within the Company’s Mining License 150; and that K92 will be successful in extracting any gold from its properties in Papua New Guinea. There can be no assurance that such statements will prove to be accurate, as actual results and future events could differ materially from those anticipated in such statements. Accordingly, readers should not place undue reliance on forward-looking statements. The Company disclaims any intention or obligation to update or revise any forward-looking statements, whether as a result of new information, future events or otherwise, except as required by law.